1.17200 Resistance worked well. This was the first target of the I SHS Pattern which we have published last week. This attempt appears to be a false breakout of the triangle in the midterm charts. After the break below of the triangle, pair tested 1.15800 as we published. You can view the idea here. We will have a quite “data busy” week. U.S. “Non-Farm Payrolls” and Unemployment Rates will be released on Friday. Technically, the pair closed below EMA 50 and ended the week at 1.16000. We might see a correction towards 1.16200 – 1.16570 region. Shorter term bearish pressure will remain as long as the pair holds below 1.16570. If it breaks above 1.16570, 1.16880 and 1.17200 will be the next targets. If the pair fails to break above 1.16570, 1.15700 and 1.15100 will be tested. Longer Term Oveview: Eurozone macro economic figures and fundamentals are not supporting the stronger Euro. 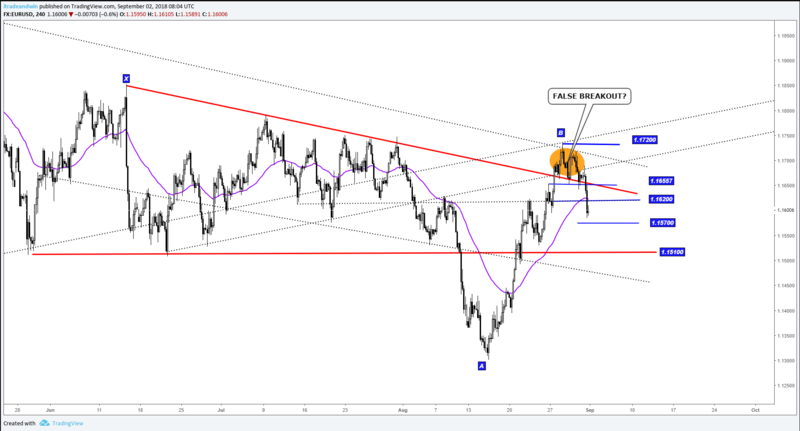 The rise of the EURUSD might be used as selling opportunities only. Intraday trade opportunities will be published for the members.